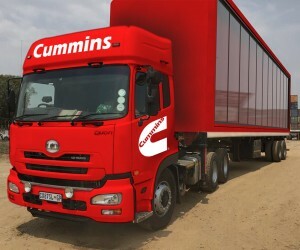 Cummins Inc., a global energy leader providing electrical power generation systems and complementary business units that design, manufacture, distribute and service diesel and natural gas engines and related technologies, is embarking on a national City to City Tour of South Africa in a highly visible red Cummins Power Truck. 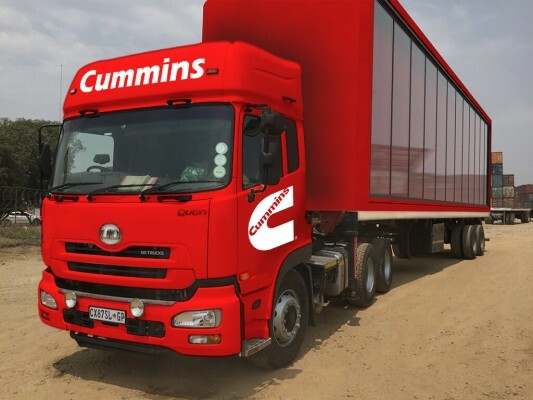 Headquartered locally in Kelvin View, Johannesburg, the power giant will soon be taking to the road to demonstrate innovative products and the efficacy of Cummins-powered vehicles on the Cummins Power City to City Tour South Africa from 30th June to 8 July 2016, starting in Johannesburg and finishing in Cape Town. Cummins, with a vast international footprint that services customers in over 190 countries, has previously used ground breaking methodologies to introduce products to customers. Going on tour to demonstrate innovative products is not new to the company. In 1931, Cummins founder Clessie Cummins installed a Model U diesel engine in a truck chassis manufactured by the Indiana Truck Company and drove it across the United States. The coast to coast run spanned 3,214 miles, and was completed on $11.22 worth of fuel. Years later, in 2015, Cummins USA went on tour to provide customers the opportunity to engage with the products and technologies in The Cummins Redefining Tour, visiting many cities across the United States and Canada. In 2016, for the first time on the African Continent, the South African power generation business is taking to the road in the inaugural Cummins Power City to City Tour through the country, commencing in Johannesburg, Gauteng and then driving to Durban in KwaZulu-Natal; followed by Bloemfontein in Free State and finishing in Cape Town in the Cape, before taking the final leg of the journey back home to the City of Gold. At each destination customers will have the opportunity to network and engage with Cummins power generation experts to learn about technical information and energy solutions available. Traversing some 3600km around the country, one will be hard pressed not to notice the eye-catching bright red 17 running meters of Cummins Power Truck. The entire one side of the vehicle is fitted with reinforced glass as a roving display, beautifully showcasing two highly sought after dependable and reliable Cummins generators, the C90D5 Diesel Generator and the C315N5C Gas Generator. The International 9800I Truck is installed with a Cummins state-of-the-art 475 ISX (475 horse power) engine with a fuel capacity of 900 litres of diesel per tank. Representing the Power of One; the Truck comprises Cummins promise of a fully integrated system where all manufacturing, assembling and testing are done by Cummins, complete with a Dependability Guarantee. A drop-down staircase complete with a safety rail will allow visitors to climb aboard the Truck to interact with the generators which are securely bolted down inside the enclosed trailer. The other side of the vehicle poses as a moving billboard making the vehicle an exceptional moving showcase. “Innovation is more than a word at Cummins it is also a value that we live by. It’s all about unlocking and unleashing new ways of thinking, doing and delivering against a background of continuous improvement. We are constantly considering new ways of reaching our customers in a meaningful and memorable manner. We want Cummins to be the product of choice,” says Kenny Gaynor, Power Generation Director – Cummins Southern Africa. “Our products are world class, and therefore our marketing efforts reflect this,” he concluded. The Cummins range of diesel generators and engines is geared towards small to medium and large applications; engineered to support a host of industries, fuel types and power ratings required. The gensets are based on real-world applications and specs; available as Commercial Industrial, Commercial Mobile, Residential, Light Commercial, Marine, Recreational Vehicles, Rentals, High Horse power Commercial Industrial to Data Center Continuous for a host of sectors ranging from Banking to Mining and Hospitals, where a regular and reliable energy solution is paramount. These off the grid solutions ensure sustained productivity in the workplace and a secure source of light and warmth during the long chilly winters when power outages are not an option. Cummins products are all backed by a comprehensive warranty with support from the Worldwide Dealer Network. The generators are all fitted with Cummins diesel engines, specially designed to support the required functions. The products showcased on the Cummins Power City to City Tour include the popular C90D5 Diesel Generator and the C315N5C Natural Gas Power Generator. Technical presentations and discussions led by Cummins power generation experts Kenny Gaynor and Nalen Alwar will provide engaging and interesting networking opportunities for customers to learn about the Cummins products, energy solutions, off-the-grid power options and new technologies. Master of Ceremonies John Vlismas, South Africa’s popular stand-up comedian and jokester, will ensure the Cummins Power City to City Tour is both memorable and enjoyable. A national Spot The Cummins Truck online banner competition on news channels and Facebook will allow public engagement and interaction with The Cummins Power City to City Tour. Customers and the public are encouraged to monitor the URL http://media.ngage.co.za/cummins-power-tour-sa for information on the competition. Questions will be posted on the web page and answers need to be tweeted to @Cummins_Africa #SpotTheCumminsTruck. Fabulous prizes are up for grabs and all lucky winners will be notified by the company. News24, Fin24, FM Online, Business Day Live and the Cummins Africa Facebook page will provide direct links to the web page for quick and easy engagement.